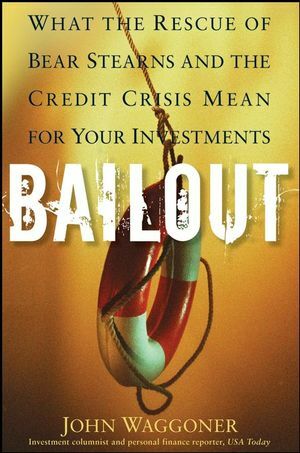 In Bailout, John Waggoner answers the essential questions surrounding recent market catastrophes—from the failure of Bear Stearns to the credit crisis—and reveals how you can protect your portfolio during these turbulent times. Waggoner offers a wide range of strategies to help your portfolio weather this storm, including rebalancing and using foreign currencies, and discusses how Treasury bonds, gold, commodities, and real estate can solidify your financial standing. With the expert advice found here, you’ll quickly discover what it takes to achieve safety and success in today’s volatile market. John Waggoner is the investment columnist and personal finance reporter for USA Today, where he writes a weekly investing column. Previously, he was senior editor at the Independent Investor, an investment advisory newsletter. He is also the author of The Fast Forward MBA in Investing, which is published by Wiley, and coauthor of The Busy Family's Guide to Money. Chapter 1: What Just Happened Here? Chapter 2: How Did It All Begin? Chapter 4: Matters Become More Serious. Chapter 6: What's the Worst That Could Happen? Chapter 8: Creeping Infl ation.